One key to professionalizing the foresight field is finding better definitions of what strategic foresight work actually is, and who engages in it. Our field must recognize all the parts of itself as it grows up, so we can better share and compare our models and methods, and do better collaborative work on foresight problems. This is an exciting time for foresight practice, as our leading professional organizations are all searching for new and more inclusive definitions of our field. We can define strategic foresight as future thinking that has the potential (the capacity) to make an entity (individual, team, organization, etc.) more adaptive, or successful. It won’t actually make an entity adaptive unless it is also coupled to successful action. The combination of successful foresight and successful action skills will be called adaptive foresight in this Guide. As we’ll now see, there are six thinking types that all professionals use to generate strategic foresight. The some of these thinking types can be grouped together, giving us Four Foresight Skills. When we use these consciously, and ask how to balance them against each other for the problem at hand, we have the potential to generate the best strategy we can. We can group the first two of these thinking types, the Past and Present, as preparation for future thinking. We can also group defensive thinking (Preventable futures) and advantage thinking (Preferred futures) as the two most fundamental types of strategy. That gives us four key practices, placed here into a particularly effective order. When strategy is subject to cognitively, skill, and experience-diverse critique, this order is also a self-improving cycle. We’ve labeled the practices with four words, Learning, Anticipation, Innovation, and Strategy, that are particularly useful to organizations. One great elevator-pitch definition of foresight, taught to me by Peter Bishop, past director of the U. Houston Strategic Foresight MS, is that “foresight is anything we do prior to strategic planning.” This isn’t a perfect definition, as strategy is also a critical part of foresight, but it is a great introduction to the need for well designed and rewarded foresight practice. Most organizations don’t have any incentives, or culture to elicit any kind of thinking, discussion, or process prior to doing strategy and planning. So by calling foresight the “front end of strategy”, you can help your audience realize that if they don’t do anything consciously before they jump into their strategy work, and most teams don’t, they are presently missing an entire set of practices, developed over the last sixty years by foresight practitioners, that promise to greatly improve their strategic outcomes. Strategic foresight is a large set of thinking, discussion, and practices we can do as inputs to strategy, that will reliably make make strategy (the last foresight skill) both more future-aware and future-resilient. Let’s look more closely at the four core foresight practices now. We will begin with the practice that is most commonly missed in foresight education and professional foresight today, better thinking and models of the Past and Present. For simplicity in this Guide, we will group these two together as: learning. Cognitive science tells us that before we engage in foresight in any topic or problem, we always begin with some form of learning. That learning comes with some mix of our prior accumulated experience, and awareness of our current operating environment. We could separate these two types of learning, as historical research into the relevant Past of a particular problem, identifying relevant trends, cycles, and models that have operated in the past, and as intelligence, horizon scanning, and data collection in the Present about where we are today, and the current values of those relevant trends, cycles, and causal factors, as we understand them. These two can be grouped together as one skill, Learning, or preparation for foresight. Keep in mind that when you learn about your environment, you must do both of these things, and some people on your team are going to be better at learning from the past (historical research) and others at learning from the present (intelligence gathering, events monitoring, horizon scanning). Both kinds of preparation are critical to the next P, the exploration of Probable futures, as the first of three basic types of future thinking. 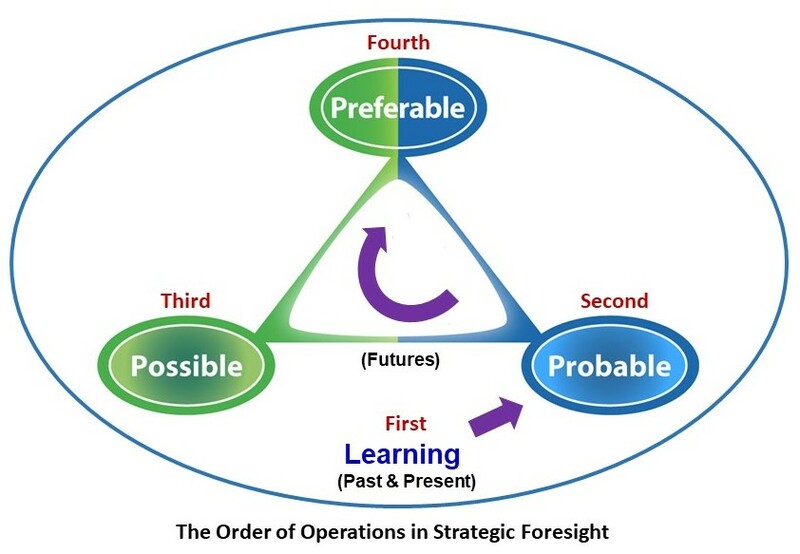 Even though learning is not technically a type of foresight thinking or output, our past and current experience of the world are so critical to the way we perceive, formulate and research a problem, we must group learning with the Four Ps of foresight thinking (introduced below), when we talk about critical foresight skills, or practice types. No one can build good foresight without good models of the past (hindsight) and the present (insight). These two temporal domains, past and present, are the realm of learning. Respect and use them well, for they are the gateway to successful foresight thinking. A well-known rule of forecasting is that we must first look back, at least twice as far as we wish to look forward, to see the relevant trends, cycles, causal factors, and models applicable to any complex system. We must also adopt a curious, critical, and evidence-based attitude. Careful research of the relevant past and present is a necessary first step in producing new foresight, and we also need to get critical input from everyone with deep experience in the problem area. Practitioners who skimp on this learning step can easily rely on old models and outdated information, and the quality of their work suffers greatly as a result. When we are focused on the types of actual foresight thinking we do, we will talk about the Four Ps. But when we are concerned with the thinking types we need to create strategic foresight, we must instead talk about the Six Ps. Grouping the Past and Present for simplicity in this Guide, we will use the acronym LAIS, to signify four even more descriptive words in organizational contexts, Learning, Anticipation, Innovation, and Strategy, for these skills. We can remember LAIS as the first four letters of the phrase “LAISsez Faire”, which describes entrepreneurial freedom, a critical ingredient of capitalism. Learning. First we must try to understand where we came from and where we are. We collect relevant history, trends, cycles, causal factors, and models. We look carefully and analytically at history, and far wide (horizon scanning) at the relevant present environment. This is largely divergent thinking. Anticipation. Next, we try to extrapolate (forecast) the relevant trends, consider the way they may interact to create more change, and make some probabilistic predictions. We look for constraints and likely outcomes of the past and current state, both obvious and hidden, and we try to estimate risks. This is largely convergent thinking. Innovation. Next we try to imagine possibilities that spring from our historical analysis and intelligence gathering (learning), and forecasting, risk assessment, and prediction (anticipation). What are some of the first, second and third order implications of the changes we expect? What changes and wildcards are we missing? What experiments might we or others do, to either gather more foresight, create, or adapt? This is largely a return to divergent thinking. Strategy. Finally, we arrive at the fourth foresight practice, the only one that is covered well in typical business management and policy books. With strategy, we analyze all the above data and try to come up with the most resilient and high value set of actions we can, to prevent bad outcomes and achieve good ones, based on our resources and goals. We stress test those strategies those against both the future we expect and the futures we can imagine, and come up with both tactical and strategic plans, for reaching our goals, and monitoring our progress toward them. This again is ultimately convergent thinking. To understand adaptiveness in any complex system, we must pair strategic foresight with adaptive action. To do that, we will need to introduce Four Action Skills as well. Together, the Four Foresight Skills and the Four Action Skills will be called the Eight Skills of Adaptive Management. The Eight Skills are core practices that every manager and leader must have on their team, and they are the main Foresight+Management model we will use in this Guide. We’ll introduce the Eight Skills in the next section, but for now, let’s look closer at the Three Ps, and when we include sentiment, the Four Ps, to understand the kinds of foresight thinking that we all use, unconsciously or consciously, to navigate the future. The first good, evidence- and complexity-based model of what foresight thinking is, in my opinion, was first introduced by Alvin Toffler in 1970. Toffler may be the 20th century’s single most important futurist. He is also arguably the best known futurist of that era. Every one of his works is worth reading to better understand the future, even today. In his international bestseller, Future Shock (1970), as prescient today as when it was written, Toffler explored the social effects of the increasingly important role of accelerating change in humanity’s future. Toward the end of this prescient work Toffler argued that foresight thinking can be divided into three key practice types, and he suggested that division would help us to professionalize the foresight field. The primacy of these three approaches to foresight thinking was supported again in 1980 by the influential foresight practitioner Roy Amara , an early president of the foresight think tank, Institute for the Future (IFTF) (founded 1968), in an internal report for IFTF, published the next year in The Futurist, the magazine of the World Future Society (The futures field: searching for definitions and boundaries, The Futurist, Feb 1981). Having a second well-respected futurist give this framework credence further raised its profile, and a few practitioners began calling this the “Three Ps” model. 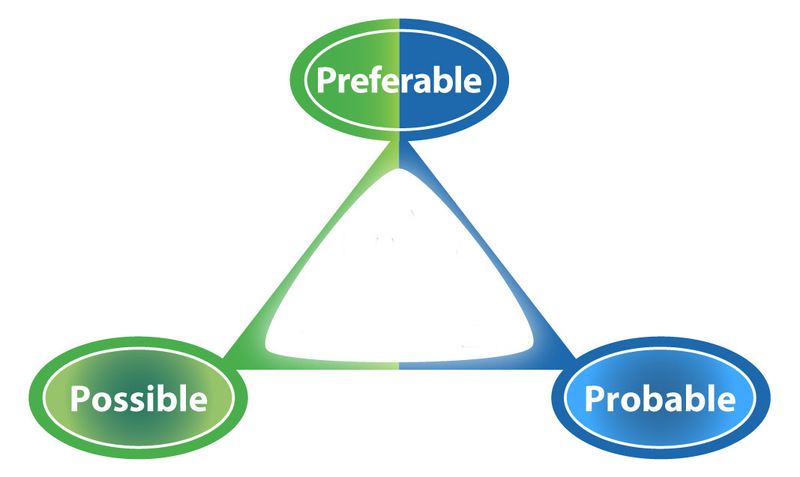 While its formal name may be the Toffler-Amara Three Ps model we’ll just call it the Three Ps (or “3Ps”) model. The Three Ps of Foresight Thinking. Preferable futures, generated only by intelligent organisms, are always a blend of the first two, more fundamental types. Probable and possible futures, by contrast, can be found in even the simplest the physical and informational processes in our universe. They describe the processes that gave rise to life, and they also constrain its future in this universe, as we’ll consider in Chapter 11. In the 3Ps model, the Primary Value Proposition of Foresight Thinking, for every individual, team, and society on Earth, is that we can use it to see better what will happen, what could happen, and what should happen, all at the same time. Let’s look now at each of these types of foresight in more detail. The Probable. The first foresight type is the probable—also called the expected or baseline future, what we think will likely happen tomorrow, usually whether we want it to or not. If it will happen independent of our desires, philosophers also call this “necessity” (versus “chance”). The probable future is dominated by convergent physical processes and thinking, and strives to become a science, though much of this kind of thinking does not yet have scientific rigor. Though it can be hard to do, this is the kind of foresight we recommend starting with when dealing with any problem, as it helps us understand the relevant predictable laws, limits, constraints, trends, and boundaries of the future. For examples of predictable, convergent, uniformity-generating processes, think of classical physics, or the laws of thermodynamics, which bind our whole universe to certain highly-predictable futures. Think also of biological development, psychological development, and social development, meaning any values, goals, agendas, behaviors, and laws that appear to be cultural universals, like the increasing preference for democracy over autocracy over the last several hundred years of human development. For business, think of predictable trends in demographics, politics, economics, technology, and all the relevant predictable elements of an organization’s competitive and cooperative environment. The Possible. The second foresight type is the possible—also often called alternative futures within the field. This is the set of things we think could happen tomorrow, or what scientists call “chance”. It is dominated by divergent physical processes and thinking. For examples of unpredictable, divergent, variety-generating universal processes, think of quantum physics, a process that is considered partly indeterministic and is characterized by irreducible uncertainty (unpredictability). Think also of the continuous divergent and unpredictable branching we see in biological evolution and its “tree of life”, and the unpredictability of human free will and imagination. For organizations, think of any activity you or your competitors might possibly take, or any of the many environmental changes that we cannot predict in advance, which nevertheless might change our strategy, plans, or actions. Possible futures are the realm of creativity, imagination, risktaking, competition, and experiment. Artists, designers, experimenters, risktakers and entrepreneurs don’t usually seek first to know the future, but to create it. The Preferable. The third foresight type is what we or our organizations want. We all generate preferences as intelligent beings, and activities like visioning, goalsetting, strategy, and planning are key aspects of preference foresight. The preferences we generate which are adaptive are those best able to survive and thrive in our competitive environment. As we will see later, preferable futures can only happen as an emergent mix of possible and probable futures, which are the two most basic types. Not to get too deep here, but the reason the first two types of futures are more fundamental in our universe is because they existed long before the emergence of life, which alone can also generate preferences. Seeing the probable and the possible as the two most basic ways of analyzing change began, as far as we know, with the Greek philosopher Democritus (460-370 BCE), who said, “Everything existing in the universe is the fruit of necessity and chance.” As Alvin Toffler reminds us, all preference foresight is also normative (values based) and political. Preferable futures are a subset of the probable and possible futures that we think will generate the best outcomes, based on our particular values. Typically we want what is best for us, best for our group, or ideally, best for all (utilitarianism). In antiquity, both Eastern and Western philosophers proposed the particular importance of three human values, the True, the Beautiful, the Good. In the East, the Bhagavad Gita, written perhaps in 400 BCE, spoke of “words which are good and beautiful and true.” In the West, Plato and Aristotle each briefly explored these three values as transcendentals, or universal properties of being. Aristotle (350 BCE) was the earliest explicit champion of the universality of these three values categories, because of his model that divided human intellect into the theoretical, the productive, and the practical. In Aristotle’s model, our theoretical mind is concerned with knowledge and truth, the productive mind with the creation of beautiful objects, and the practical with ethics and the nature of the good. Notice that Aristotle’s three “universal values” associate strongly with Toffler’s Three Ps. Those who like to explore probability foresight can be considered motivated by truth-associated values, those who do possibility foresight are motivated by beauty- or creativity-associated values, and those who explore preference foresight are motivated by goodness-associated values. These values and foresight processes track so closely with each other, we will argue that Aristotle’s three values can be thought of as a restatement of the Three P’s, from a values perspective. We will return to Aristotle’s three values, as examples of cultural universals, in Chapters 7 and 11. In foresight process and culture work, it is usually very helpful to divide the Preferable into the two basic types of sentiment that we each use to navigate the future: defensive pessimism and strategic optimism. As we have seen, both sentiments are fundamentally adaptive lenses on the future. When we account for sentiment, we must discuss the Four Ps of future thinking: Probable, Possible, Preventable, and Preferred futures. Defensive pessimism is primarily concerned with Preventable futures, with preventing bad outcomes, including identifying problems, managing risks, countering threats, and preventing disruptions and disadvantages. This is the most conservative form of preferable futures thinking. Strategic optimism is primarily concerned with achieving desired outcomes, which we can call Preferred futures (alternatively, Progressive futures), including identifying opportunities (for you and your team) and advantages (presently going to someone, not necessarily you), and creating shared goals, strategies, plans, and visions. This is a more experimental form of preferable futures thinking. Both Preventable and Preferred futures thinking are critical to adaptiveness. Good leaders employ and balance both, as individuals and on their teams. Often, we find it easiest to begin with the preventable, identifying what we don’t want. What remains, after employing defensive thinking, gets us closer to a conversation about what we actually do want. In this Guide we claim that the Three Ps (or when we include sentiment, the Four Ps) are the three most fundamental types of foresight thinking we can do, and Aristotles Three Values the most fundamental sets of values that we can champion. This view is found, more or less, in some of the leading books on foresight practice available today. We will also claim that we must practice the Six Ps, and pay very close attention to how we prepare for foresight thinking, by learning appropriate things about the Past and Present. This view is also found, more or less, in some of the leading books on foresight practice. We need to use the Six Ps well, and the first two are particularly important. I can’t tell you the number of poor foresight products I’ve read, since I became a full time foresight practitioner in 2003, that fall down because the authors didn’t sufficiently do their homework about how the world has worked in the past, and its true current status in the present, in all the relevant areas of their problem domain. Not sufficiently Preparing for foresight thinking (learning the relevant Past and Present). We’ll introduce these four foresight steps, along with four action steps as the Do loop, in the next section. But before we do that, let’s review some personal practice tips for avoiding these four “sins” below. The first tip we should keep in mind is that these four “sins” are listed in a particular order, a sequence of foresight practice that will often maximize its effectiveness. We can call this the Order of Operations in Strategic Foresight practice. Good foresight practice begins with the discovery of relevant history and current status, then it explores probable foresight, then it moves moves to the exploration of relevant possible foresight, and it concludes with the judgments and visioning of preference foresight, and the production of strategy and plans. It isn’t always done in this exact order. We often jump back and fourth between these four practice types as we’re building foresight thinking and outputs. Keeping this order in mind, and following it at least roughly at first, is a great way to balance our thinking in all the right areas. When we skip or skimp on any of these steps, as too many foresight practitioners do today, we will create much weaker, less adaptive foresight as a result. In particular, when we step repeatedly through all four of these practice types, and then couple them with effective action and feedback within a Do loop, we and our clients get progressively better at adapting as a result. Again, we have to be aware of the past and present, if we wish to see the probable future. A good exploration of the past will tell us the relevant trends, cycles, causal factors, and models that may influence or control the futures we care about. A good scan of the present will tell us all the current values of those trends, cycles, and factors, and all the emerging issues that we may need to take into account. If we haven’t done this learning work, we aren’t going to be able to do good future thinking. Many foresight programs don’t require a strong orientation to history and present first, and they produce graduates who don’t pay nearly enough attention to history and data as a result. In addition to becoming a champion of learning the relevant past and present, this Guide will help you become a better leader in Predicting (seeing probable futures), Creating (exploring possible futures) and Leading (steering toward preferable futures) change, as it says in the subtitle on the cover and home page. As we will see, starting our foresight thinking with probabilistic prediction, before mentally moving to the other two fundamental future thinking types, is almost always the best way to build good foresight. The more thinking you and your team do about relevant high-probability trends, the more predictable future outcomes you will also discover. Those anticipated, expected, and bettable trends and outcomes will very helpfully constrain, guide, and empower all your other foresight activities. Like each of the other fundamental foresight types, it is easy to do either too little or too much prediction, and to either over- or under-rely on our predictive instincts and models. Like everything important, we must find an optimal balance, and that balance is learned with experience, experiment, self-honesty, humility, and transparency. We’ll discuss some of the ways we can better manage that balance, as we grow in our predictive abilities during our lives. We need to use all the tools we can, including our best models, methods, tools, platforms, quantitative and qualitative approaches, and the most cognitively and skills diverse crowds of expert and lay opinions we can marshal, so we can better discover, determine, and predict those highly inertial or inevitable features of the universe that converge us toward probable futures, better create, imagine, and explore all the relevant possible options, and better survey, measure, and map the full pluralistic and political landscape of preferable futures and strategies relevant to the future of an issue. We also must make all of that Three Ps information as open, accessible and understood by all the relevant actors as possible, so we can all get to the best futures available to us collectively, as a team, an organization, or a planet, given the resources we have today. We call that open, collective, and digital approach Big Foresight, and we’ll say more about it in Chapter 12, where we conclude with some visions for and challenges to good foresight practice. Leading ourselves and others to preferred futures, the third fundamental foresight type, requires vision, the ability to see valuable future states that we can aim for, and the ability to inspire others to see and aim for those futures as well. But being a leader doesn’t make us adaptive. It doesn’t make us, our families, or our organizations more long-term successful. Building adaptive foresight, leading toward more intelligent, secure, resilient, and good outcomes, requires us to choose adaptive values, goals and strategies. Sometimes we get our preferences from others, and we get lucky if they turn out to be adaptive. In the long term, successful leadership and activism often require us to be able to regularly find adaptive visions in advance of action, and to enable our teams to own and improve that vision, and come up with ways to achieve it. As we’ll see, adaptive visioning requires us to build our own ideas and models of social progress, of where it is “best” for us to go next, and to constantly test those ideas and models in a critical and diverse community of others. We all must lead ourselves and others with the best models, evidence and argument we can marshal at present, and our own imperfect judgment. We’ll consider many ideas of progress throughout this Guide. Most fundamentally, our section on universal foresight will argue that our universe appears to be not only evolving (continually experimenting) but also developing in a set of predictable directions, toward greater innovation, intelligence, immunity, interdependence, and sustainability in our leading complex systems. Seeing this “evo devo” nature of the world is one of the key ways we can improve our long-term vision. In our sections on organizational and global foresight, we’ll also offer arguments that digital empowerment, a broadly useful set of approaches discussed in Chapters 7, 8, and 11, offer us some of the most powerful sets of values, goals, and strategies for improving our world.